so I can be my very best self. This is my Rec Sports. A membership or valid pass is required to use this facility. Enter on the footbridge over Washtenaw Ave. To find the Business Office, speak with the Welcome Center attendant. To see all the information associated with this facility, go to the full facility page. The main entrance is located directly on E Hoover Ave in front of Commuter North and Commuter South bus stops. Enter through the main entrance at the corner of Hubbard Rd and Murfin Ave. Limited paid parking is available in front of the entrance. To access the Building Office, ask the Welcome Center attendant. This facility is open to the general public. Enter on the south side of the building. Restroom facilities are located outside on the west edge of the building. This facility is open to the general public except for scheduled events. Restroom facilities are located nearby at the Adventure Leadership Rental Center, accessible on the outer west edge of the building. Access this space at any of the four corners of the field. Adjacent tennis courts and basketball pads are located south of the field and track. Contact us to rent this space. When you drive here, look for a gravel driveway marked with a blue “Adventure Education Center” sign. Follow the driveway to the open field for free parking. Park and walk across the field to the Team Center building. You’re joining more than a gym. Whether you’ve been working out for years or you’re new to the gym world, it’s our mission to be present and standing by, ready to offer instruction, advice or just a word of encouragement. Members get open access to our machines, weights, courts and pools in the comfort of a supportive environment. A Group‑X pass is the ticket to waking up your workout. Choose from a variety of classes including dance-inspired yoga, cardio and strength—all taught by dedicated instructors who will engage, inspire and push you to grow. Start now. Sometimes one-on-one support can be the difference between achieving your goals or abandoning them. 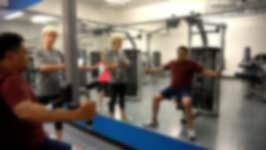 Whether you’re new to the world of gym equipment, recovering from an injury, or want to take your workout to another level, our personal trainers will map out a path to success, custom made for you. The best of both, designed for you. Get individualized training among the support of your group—small group training combines benefits of two great programs into one to help you succeed. Intramural Sports offer the perfect balance of competition and community. Whether you’re a beginner or an aficionado, there’s a team for you. So join us and be apart of a Michigan tradition that began in Recreational Sports more than 100 years ago. We are Wolverines. We are true blue athletes. We play for school pride. We play to be champions. We play for Michigan. Learn how you can be a part of championship teams who bring home titles for your school. Shoot the rapids, explore the wilds of the Keweenaw or go spelunking. Learn about wilderness survival, outdoor cooking or how to build a winter shelter. Rent a tent, a camp stove, a canoe or a mountain bike. Get in on one of our exciting trips or use our rental gear to make your next vacation an affordable getaway into the great outdoors. Improve communications. Break down barriers. Encourage collaboration. Foster teamwork. Reshape your culture. Kick off a new project. Whatever your goals may be for your department, team or organization, we challenge you to be better together. Planning an outdoor adventure doesn’t have to include an expensive trip to the nearest outfitter. Just rent from us instead! We offer inspected and dependable equipment like tents, lanterns, kayaks, canoes, skis and more.